2) Make paste of curry leaves, mint leaves, coriander leaves(by adding some water). 3) Make poppy seed powder and add chopped coconut then make paste out of it(by adding water). 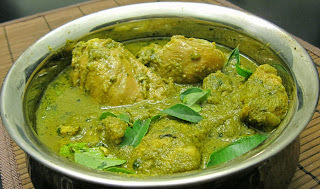 4) Make green chillies paste. 5) Heat oil in pan and add "Spices" After few seconds add all the pastes with you. 6) Cook it on low flame make sure that you are not burning bottom. 7) Add curd and salt, mix well. 7) Add chicken and cook till it done soft and juicy.